What is the difference between Cottage Pie and Shepherds' Pie? Short answer: the kind of meat you use. At least if you are in the UK, where the recipe seems to have originated. 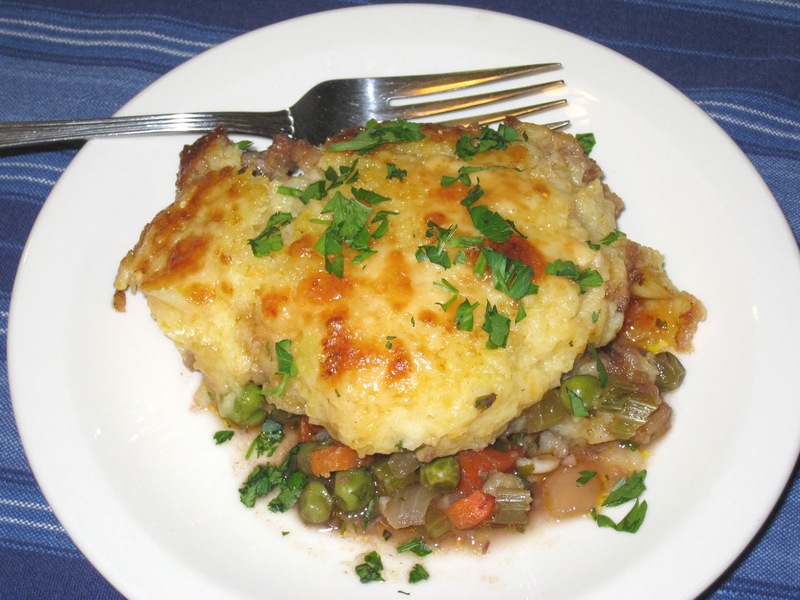 Traditionally, a cottage pie is made with beef and a shepherds' pie is made with lamb. Both were made utilizing leftovers from the Sunday roasted meat and vegetables. Here in the states, however (at least in my memory), shepherds' pie was introduced using beef, so shepherds' pie is what we called it. And that is what I called it when I first wrote about it in this post. But now that I know the difference, I am calling this dish Cottage Pie. For reasons that are irrelevant to this post, I made a 4 or 5-pound pot roast over the weekend, thinking I would freeze half of it, but I am embarrassed to say I did not have enough room for half of a pot roast in my freezer (and there you have the reason after all). So I chipped away at it all week and still had half left by the weekend. What to do with the leftovers? I thought about soup, but a chance encounter with a rutabaga at the Green City Market changed my mind. I thought about mashing it and that thought led to adding potato, and from there it was a short hop to cottage pie, and an even shorter hop led to my decision to add cheese to the potato-rutabaga mash. I am quite proud of my achievement on this dish. The vegetables are tender but still firm and the meat becomes melt-in-your-mouth tender. The rutabaga lightens up the potatoes and keeps the cheesy topping from taking over completely, but it has that rich buttery flavor and texture that you want in a mashed potato topping. And as much as I have always enjoyed this dish with ground meat, it becomes transcendent when you use leftovers. I think I will be adding too much meat to my roasting pot more often just so I can keep making it this way. Heat the oil over medium heat in a large skillet. Add the carrot and cook until softened, about 5 minutes. Add the celery, onion and garlic and cook until tender, approximately 5 more minutes. Season with salt and pepper. Add the beef and the peas and cook until they are heated through. Add the herbs and parsley, stir them in, and remove from the heat. Adjust seasoning as required. To make the potato and rutabaga topping, combine the chopped potatoes and rutabaga in a medium saucepan and fill with just enough cold water to cover the vegetables. Bring to a boil over high heat, then reduce the heat to low and simmer until a knife slides easily into both the potato and the rutabaga. Drain the vegetables and return them to the saucepan and place it back over the low heat. Mash them well, adding enough milk to bring them to the desired consistency. Add 1 cup of the cheese and the butter and stir to melt them into the mixture. Taste for seasoning and add salt and pepper as needed. Place the cooled meat mixture into a 2-quart round or 8 x 8-inch square baking dish. Add the wine, being sure that the liquid does not rise more than halfway up the mixture. Drop spoonsful of the mashed potatoes and rutabaga evenly over the beef mixture and then spread it out, making sure that it reaches all the way to the sides of the dish. Sprinkle the remaining half cup of shredded cheese evenly across the top. Bake at 350 deg. F. for 50 minutes. The beef mixture should be hot and bubbling. If desired, place under the broiler for 2 minutes to brown the potatoes.